When social media comes to mind, SlideShare might not be on the top of your list. Most B2B marketers use social media networks, such as Twitter, Facebook, YouTube, Instagram and LinkedIn to amplify their content. However, they often overlook the social media and content hosting power tool that SlideShare has become. Founded in 2006 and acquired by LinkedIn in 2012, SlideShare allows users to easily upload and share presentations, infographics, documents, videos, PDFs and webinars. Known as the YouTube of presentations, SlideShare has numerous benefits that we’ve been enjoying here at TopRank Online Marketing for some time. In fact, TopRank’s SlideShare account is one of the top 1% most viewed and has had nearly 1 million views of the 66 presentations and eBooks we’ve uploaded there. 1. It’s free – Who can argue with the price of free? You can upload multiple types of content on SlideShare which can then be found through your SlideShare network and through search engines like Google. Did we mention that SlideShare is free? 2. Visually rich content. – Let’s face it: any audience loves visuals. 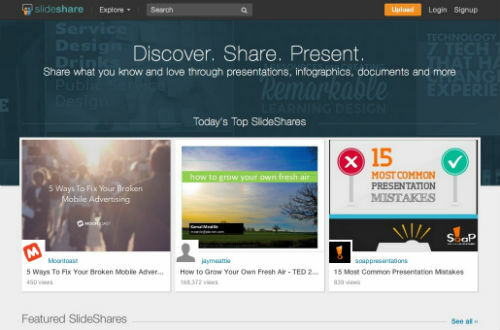 With SlideShare, you can enrich your presentation with video, audio, images and designs that represent your brand. When creating content, it is best to use limited text and as few slides as possible to convey your ideas. 3. Provides free analytics – With no extra payment, you can access the analytics of your SlideShare account. This lets you see who is viewing your presentations, where they are being referred from and which of your presentations are the most popular within your target market. 4. Embeddable – SlideShare content can be embedded on any other website or blog. If your content is interesting enough, other people may use the provided ‘Embed’ feature to publish a copy of your content on their website, exposing your message to an entirely new audience. 5. SEO friendly – SlideShare is a very popular website, attracting thousands of links and social shares every day. These signals improve the ranking of SlideShare content in search results. Because SlideShare allows you to use title tags and meta descriptions, it facilitates optimizing your presentation content for better ranking in search results. By optimizing your presentations, you can make it easier for buyers to find your content within SlideShare and on search engines like Google and Bing. 6. Attracts traffic to your website – As SlideShare is one of the highest-traffic sites on the Internet and receives over 60 million unique visitors every month, it is a great tool to increase traffic to your site. With SlideShare, you are able to add hyperlinks to your corporate website from your profile page and from within your presentation – but not on the first 3 pages. If viewers want to learn more about your company, they have easy access to do so, just by clicking links embedded into your presentation. 7. Connects to your LinkedIn and Facebook accounts –With SlideShare apps for LinkedIn and Facebook, you can display your most recent presentations. When adding a new presentation, it will notify your SlideShare network, indicating that there’s new content to be viewed. By showing SlideShare presentations on LinkedIn and Facebook, you can easily gain more visibility to your content. 8. Grow a network on SlideShare – The social networking features within SlideShare allow other people to follow your account so when you upload new content, they can be notified by email that you’ve published something new. Users can also comment and like presentations. 9. Supports repurposed content – From changing visuals to modifying copy for a different audience, presentations on SlideShare are a great way to repurpose existing content. Extracting quotes and statistics from your content and using them in images gives you a new way to create visual content like presentations or infographics that can be hosted on SlideShare. SlideShare is a powerful content hosting and social media tool for B2B marketers to publish unique content and repurposed content alike, all while giving access to a whole new audience. Whether you’re publishing presentations from a conference, an eBook or an infographic, SlideShare provides multiple ways for potential customers to find your content.